The Alcone Sub 10 is a perfect addition to Alcone Lagrange XT or other satellite systems. Dimensions are 48 x 38 x 38 cm (HxWxD) containing an Alcone AC 10 HE with aluminium cone and a Audaphon AMP-24 amplifier with an output of 180 Watts (bridged) into 8 Ohm or 2 times 90 Watt into 4 Ohm. 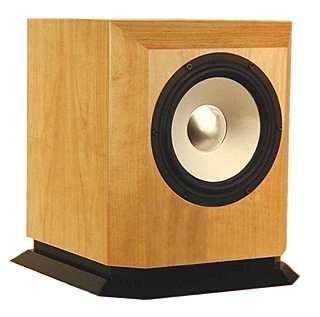 The concept of the woofer is more than 18 years old: The reviewers of Klang+Ton 3/98 described the subwoofer as follows (together with another amplifier, which is no longer produced): "The Alcone Sub 10 subwoofer produces a very low, yet absolutely precise bass and shows an enormous power handling. Additionally, a full house of all sorts of imaginable features makes it easy for the user to operate the unit. This subwoofer has all that it takes to become a classic." Now in 2016 a new amplifier was added: Audaphon AMP-24. AMP-24 consumes as little as 0.5W in standby. The Audaphon AMP-24 amplifier module is located at the rear of the cabinet. The module features state-of-the-art Class D amplification ensuring enormous power output with top quality sound, fitted in a small cabinet.